My first problem on reporting this match was the simple one of the 11 hour time difference. 3pm on Saturday in the UK equals 4am on Sunday in New Zealand. So, an early start. Thanks to jet lag, that was not a problem. There is a long tradition in NZ of getting up in the middle of the night to watch live European sport, so it wasn't that difficult to find a sports bar showing the game and with the offer of breakfast thrown in. Needless to say, there were loads if Chelsea 'fans', but only myself and a couple of backpackers supporting Saints. As soon as we saw Stephens, Yoshida, Hoedt, Cédric and Bertrand on the team sheet, we knew we were in for another Manchester City type backs to the wall game. It actually took a couple of minutes to realise that this selection meant that van Dijk was on the bench. Gabbiadini again had the unenviable task of being the sole striker, who would be unlikely to see anything of the ball. The midfield was Romeu and Højbjerg, with JWP and Redmond on the flanks. Rotation rules then. Chelsea made the initial running but their best chance in the early running, with Cédric down injured, after a clumsy challenge from Cahill, Willian played a one two with Alonso, but shot thankfully wide. Cédric had to go off injured in the 17th minute and he was replaced by Lemina. In a sustained amount of pressure from the blues, Forster looked unconvincing in dealing with shote from Alonso, Cahill and Kante, none of whom made the most of their opportunities. Conte was entertaining on the sidelines, going mad at the officials, as they failed to award a penalty for Romeu's challenge on Christensen (It clearly wasn't). Shortly after he was complaining to the officials again, this time about Saints time wasting (which they clearly were). Then a shot from Pedro slammed against the post after a deflection. The games decisive moment followed, with the game deep into time added on at the end of the first half, Yoshida brought Hazard down with a clear foul and the referee, Roger East, awarded a free kick. It looked as if Willian was going to take the kick, but instead Alonso curled it around the wall and into the bottom corner of a surprised Forster's net. 1-0. So, that was the last action of the first half, during which Saints failed to manage anything of any substance. Having said that, they were making more of a game of it and were far more disciplined than in the shambles of a performance against Leicester. There were no changes at the start of the second half and it was not long before Hazard thought that he had scored Chelsea's second, but Fabregas was offside. Gabbiadini had already been swopped out for Charlie Austin and you have got to wonder what the little Italian makes of Saints these days. Austin then very nearly scored with what must have been his first touch of the ball, when Højbjerg sent a great ball through to him, but Courtois was there to deny him. What followed next was subject of some debate in the bar, as Courtois seemed to handle the ball outside the area and Højbjerg was very vocal in his appeals to Mr. East, who was unmoved. It looked like handball to me. That was the Dane's last contribution, as Boufal then replaced Højbjerg. 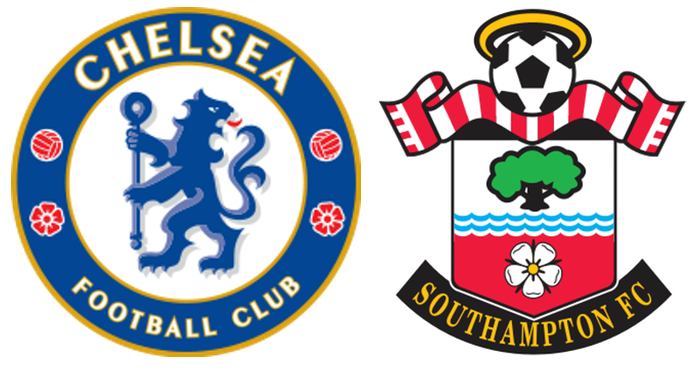 Saints never really made Chelsea work that hard, but I felt that a draw would have not been an unreasonable result, as they were not that convincing either. The last action, in the 93rd minute of the game, saw Bertrand have to go off injured, with what looked suspiciously like a hamstring injury. As Saints had already used their three substitutes, they had to play the final few seconds with ten men. So, at the end of a frantic week of three important games and Saints have not managed to gain a single point. There is little getting away from the fact that the team is in trouble. What the answer is, I don't really know, but there is little point in setting the team up so defensively, if you then don't at least get a point. Next up, Huddersfield at St.Mary's on Christmas Eve. Must win? !